WILLEMSTAD – Today was a special day for Curaçao Airport. Several new concessionaires had their grand opening today. 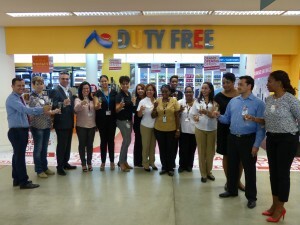 This took place in the present of the management of the Curaçao Airport Partners (CAP) and members of the local media. 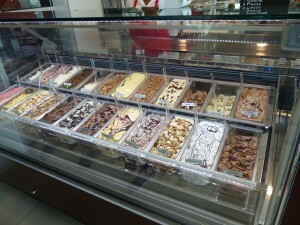 The new concessionaires are Britt Shop Kiosk, Aldeasa walkthrough Duty-Free, On The Rocks and Bella Italia. Representatives of each of the concessions presented themselves and their products. Britt Shop Kiosk is not actually new to the airport, but they added a new store where the check-in counters are located. Aldeasa also changed location. They are much bigger now and have more products to offer. They are located in the baggage claim area. 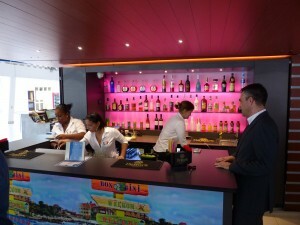 On The Rocks and Bella Italia are both located in the Arrivals Hall. CAP also presented its newest advertising possibilities in their Arrivals Hall at the airport.